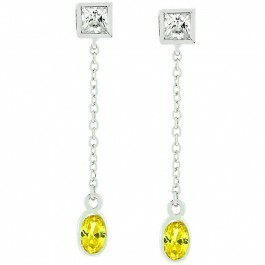 Yellow Dream Dangles displays a brilliant princess cut clear CZ and also a dangling oval cut yellow CZ. This pleasing combination of colors will rest comfortably while dangling from your ear. White Gold Rhodium Bond is achieved using an electroplating process that coats the item with heavy layers of rhodium, a close cousin of platinum that costs three times as much, which gives our jewelry a platinum luster.